Squarespace is a platform for building beautiful websites. With Uploadcare, you can implement powerful serverless file uploads in any Squarespace project in 6 minutes. Before we proceed with integrating file uploads into your Squarespace project, let’s make sure everything is in place. The first thing you need is an Uploadcare account. So Sign Up if you haven’t done so before. On the dashboard create a new project or go to an existing one. Navigate to the “API Keys” section and obtain your Public API Key. Sure thing, you need a Squarespace account. Learn about the Squarespace sign-up flow here or skip this step if you’re already signed up. If your Squarespace project implies uploading non-image content, you will have to provide billing info in your Uploadcare account. Scroll down to the “MORE” section of the menu. Choose the “Code Block” element from the menu. In case you want to learn more about adding blocks, check out the Squarespace tutorial. Don’t forget to replace YOUR_PUBLIC_KEY with the Public API Key mentioned in the Before We Begin section. The data-images-only attribute in the widget input element is an option that allows uploading images only. It’s there to provide a fail-safe experience for Free Uploadcare accounts with no billing info added. If you added billing info to your account, remove the data attribute to handle any file types. That’s it. 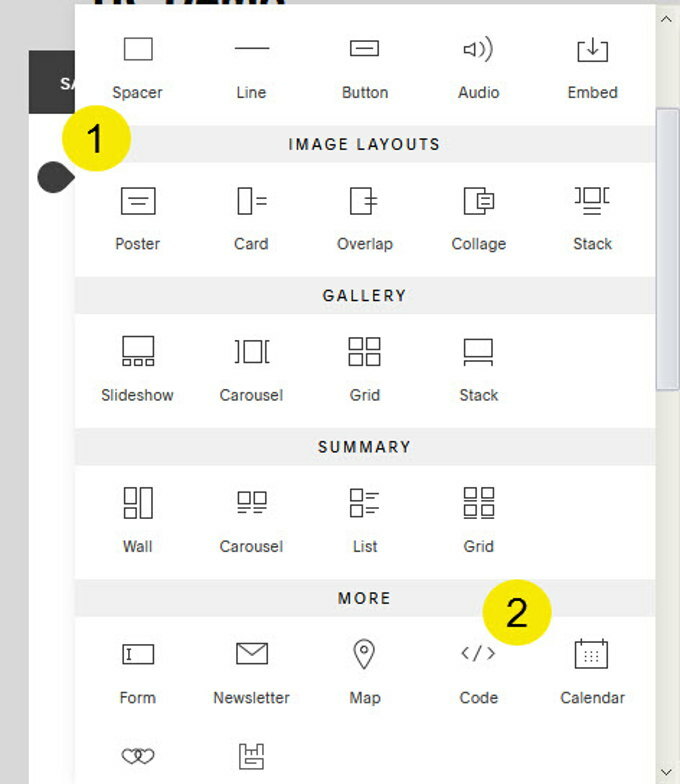 If you want to tailor the widget UI to your page layout, check out styling options. Congratulations! You have just powered your Squarespace project with file uploads. There’s more to what File Uploader can do: showing image previews, applying interactive crop or editing images in any browser. Check out the live widget configurator to discover available options and get ready-made code snippets. In case you have any questions feel free to post those around our community area.